Business Culture in Belgium is characterised by: business communication, business etiquette, business meeting etiquette, internship and student placements, cost of living, work-life-balance and social media guide. This first section provides you with a very short introduction to Belgium. External links at the end of the page provide you with more in-depth information about relevant topics. Belgium is bordered by the Netherlands in the north, by Germany in the east, by Luxembourg in the southeast, and by France in the south. Its western coast faces the English Channel and the North Sea. It has two main rivers, the Scheldt (Schelde/Escaut) and the Meuse (Maas). With a population of just under 10.5 million and a surface area of 30,528 km2 Belgium is, after the Netherlands and San Marino, the most densely populated country in Europe. One village often leads into another. Although by affiliation a predominantly Catholic country (although this is not supported by church attendance), Belgium practices freedom of religion. The single most significant characteristic of Belgium is the Germanic/Romance languages linguistic divide, which cuts the country into two more or less from East to West. There is no generally accepted explanation for this, but it was firmly established as the country emerged from the so-called Dark Ages. Following the implementation of language laws enacted between 1873 and 1963 French, Dutch and German have been the country’s official languages and there are various stipulations regarding their use. At the last census, 60% of Belgium’s inhabitants were Dutch speakers, nearly 40% French speakers and less than 1% German speakers. In fact, it comes as a surprise to many foreigners to discover that the most spoken language of the country is indeed Flemish (the local form of Dutch) and not French. The landscape of Belgium is remarkably varied. It extends from the Polderland of Flanders with its jewel-like mediaeval towns, through the Pajottenland to Brussels, onwards to the Ice Age landscape of the Fagnes/Vennen in the east, the heathlands of the Kempen/Campine in the north and southwards, to the exquisite valley of the Meuse and the sweeping uplands of the Ardennes, with much more in between. The highest elevation in the country is just below 700 meters, while much of the northern provinces are only slightly above sea level. In geographic terms, Belgium is divided into ten provinces. These (and their populations) are Antwerp (1,680,000), Limburg (810,000), East Flanders (1,377,000), West Flanders (1,136,700), Vlaams-Brabant (1,037,000), Brabant Walloon (363,500), Hainaut (1,282,500), Namur (455,500), Liège (1,028, 800) and Luxembourg (256,000), the last of these being an entirely separate entity from the neighbouring Grand Duchy of Luxembourg. The population of Brussels the Capital is about 1 million. The average temperature in Belgium is 9.8º C, average annual rainfall is 780 mm and the average annual number of hours of sunshine is 1,555. Belgium’s reputation for rain is justified, yet it often passes almost unnoticed as the climate away from the coast tends to feel continental rather than Atlantic. 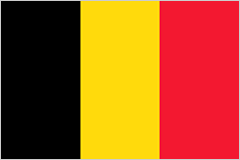 Belgium is in the time zone of UTC+1. However, during the summertime (March to October) the clock is changed to summer time UTC+2. According to Professor Jan Kerkhofs of Leuven University (KUL), a consensus exists in Belgium on fundamental values. The Flemish and Walloons are closer together in their value judgements than either the Flemish are with the Dutch or the Walloons with the French. While there are noticeable behavioural differences between individuals and to some extent between Communities, the Flemish often show more self-awareness than the Walloons, for example, Belgians in general tend to be self-effacing in comparison with their neighbours, the French or the Dutch. History has taught them to keep their own counsel and be self-reliant. This can be very perplexing for people from other cultures who, when they put a question to someone, expect a clear answer. The Belgian tendency is to avoid an immediate commitment and wait for the situation to evolve. In management situations, this hesitancy can also be caused by a sense of submission to authority which, although no longer as marked as it was thirty years ago, is still there, particularly when you get closer to the shop-floor. This is confirmed by the experiences of many CEOs of so-called Benelux subsidiaries, who have found out the hard way that, if you present a management decision to your Dutch employees, they will challenge your decision and may well propose alternatives. Present the same decision to your Belgian employees and they will say nothing but still not ‘buy in’ to it, in other words, you will experience a covert resistance. This reserved nature is balanced, however, by the pragmatism and ultimate common sense of the average Belgian. People are results-oriented and very hard workers provided the employer respects the rules. It is possible to develop a warm relationship with a Belgian, perhaps more so in the case of the Flemish than the Walloons, but it may take time. With the exception of those with a compulsion for upward mobility, Belgians are essentially very amiable and polite people. Status symbols mean very little to most of them, although they aspire almost universally to two things, their own home (generally a house in the outer suburbs) and a decent car. When doing business in a foreign country, you need to be prepared to experience things that are different from your own culture. Without proper preparation and planning you may find yourself experiencing culture shock which can have a negative influence on the outcome of the business. It is understandable that, as an active business person, you can only invest a limited amount of time into the exploration of these cultural differences. Belgian educational standards are generally very high in all parts of the country. University education is the responsibility of the French and Flemish Communities. Among the larger Belgian universities, two are governmental institutions: the French-language Université de Liège and the Dutch-language Universiteit Gent. The remaining four major universities are private but heavily subsidised. The Catholic University of Louvain, founded in 1425, split into two universities in 1970. The French-speaking Université Catholique de Louvain, which has approximately 17,000 students, is located in the town of Louvain-la-Neuve; the Dutch-speaking Katholieke Universiteit Leuven, in the Flemish city of Leuven, has about 22,500 students. The University of Brussels, founded in 1834 on the principle of libre examen, also became two universities in the spring of 1970: the French-speaking Université Libre de Bruxelles, with some 12,500 students; and the Dutch-speaking Vrije Universiteit Brussel, with approximately 6,000 students. There are also a number of other universities, as well as university-level professional and technical schools and academies of art and music offering a higher, non-university education, and international business management schools. Candidature/Kandidatuur: The first cycle of study, is completed by successfully passing approximately 10 examinations covering 380 hours of class work at the end of each year. This is not a final diploma and represents two years of study (three in the case of medicine and veterinary medicine). Licence/Licentiaat: The second cycle of university study and the basic Belgian university degree: requires, first, the successful completion of the “candidature/kandidatuur” or its equivalent, and second, the passing of approximately 10 examinations at the end of each year covering about 380 hours of class work. Duration: two years in most fields (three in dentistry, law, psychology, engineering, and veterinary medicine; four in medicine). Doctorat/Doctoraat: Represents three or four additional years of research and the presentation of a thesis. Other third cycle programmes, such as a Licence spéciale/ bijzondere licentie may last one or two years. Agrégation/Aggregatie: Represents at least three years after the “doctorat” and the presentation of a more important thesis. University qualifications are essential in many sectors of Belgian business and are taken very seriously. They more or less predetermine the ‘pecking order’ in certain disciplines. Most young Belgians are both linguistically proficient (particularly in the Flemish Community) and computer-literate. When doing business in a foreign country it helps to have some knowledge of the language and computer competency of your counterparts. You can then decide whether it is safe to rely on the host speaking your language or whether it is necessary to travel with an interpreter. Computers and electronic communications can significantly increase the pace of business negotiations. At least some awareness of your business partner’s computer literacy may help you adjust both your expectations and the degree to which you incorporate the appropriate technology into your negotiations. It may help you save valuable financial resources as well as time. Internationally, Belgium has always been a very open society. Important communities of second and third generation immigrants can be found in most parts of the country: Italians and Poles in Charleroi and the old coal-mining regions of the Borinage in the south and Limburg in the north, Arabs and Turks in inner Brussels, and an important Jewish community associated with the diamond industry in Antwerp. The country now provides simplified work permit procedures for immigrants from all EU countries, including the latest member states in Central and Eastern Europe. Belgians are not a particularly mobile people: they tend to stick to their roots. However, there is a rapidly increasing expatriate Belgian community of business people, largely reflecting the natural pragmatism and flexibility of the Belgian mindset: comfortable with cultural ambiguities, linguistically skilled, modest yet knowing their own value, and disinclined to impose their own culture on others. Although Belgium is a relatively open culture, there are some issues that are best avoided, particularly at the beginning of a relationship.